What do you do and how do I book? 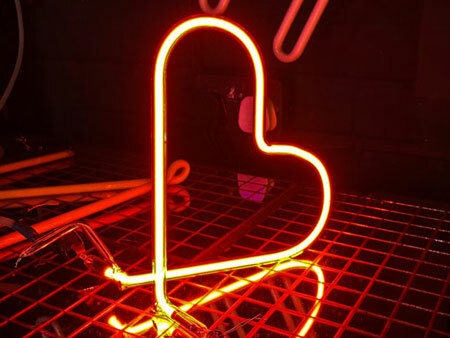 We are an artisan neon art studio on Brighton seafront that designs neon for industry and art. Occasionally, we share our skills. 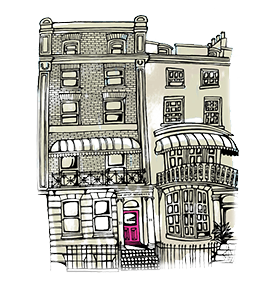 Whether you are an expert requiring a masterclass or an absolute beginner looking for an unforgettable weekend you have come to the right place. We offer two options; the two day weekend course, and the one day experience. 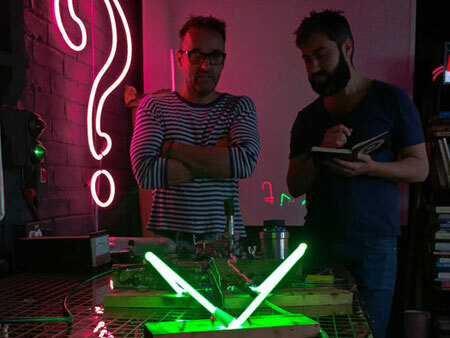 Both courses reveal the methods involved in making neon in a fun, personal way. 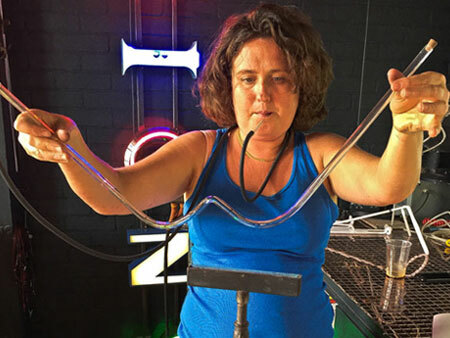 Students also get to take home a neon, crafted from 150cm glass tubing. The main difference is the level of training we give, and the time you have. Please see the booking page for more details. Courses cost £950 and £595 respectively, per person and includes all the neon equipment and materials you will need. If you have any questions please call call (01273) 694662 or use the contact form. 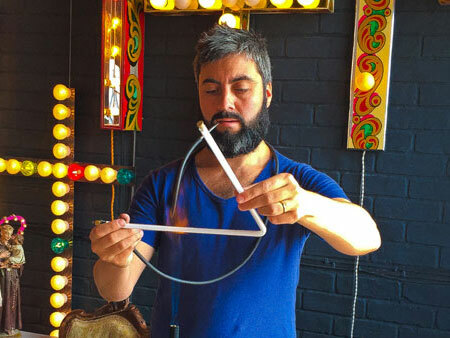 Andy Doig will take you on a neon rollercoaster, from the very early stages of design through to blowing glass, filling it with neon and lighting it up. It’s all very hands-on. You can make anything out of 150cm of neon. We provide all the equipment and materials you need, including your transformer, glass and gas. At the end of the course you will walk away with a piece of neon sculpture. What can I make and what should I bring? We will contact students a week or so before their course starts with a short brief of what they can and can’t realistically achieve. Basically we encourage creativity and refrain from boxing the student in. Having said that, there are limits! What do I need to bring? Not Much! Again we will remind you of some basic preparations prior to the course. Bring a pack lunch if you don’t fancy Fish and Chips on Brighton seafront.